Convoy Street in Kearny Mesa is home to an awesome selection of nearly 100 excellent Asian restaurants, which can easily claim the title for being the best of the best in America. This multitude different styles and tastes from different countries are clustered together in min malls along a wide 1.5 mile long thoroughfare (see map). The useful map below breaks down the hundred dining selections by category, so for example, if you’re looking for Korean BBQ, there are 11 restaurants to choose from. These are easy to find by matching the number in the legend with the number on the map. Here is where hungry diners come to satisfy their craving for the best tasting Chinese, Japanese, Korean BBQ, Thai, Vietnamese and Taiwanese cuisine outside of the Orient. Hours of operation do vary, but generally speaking restaurants are open from 11 a.m.- 11 p.m. and all major credit cards are readily accepted. Plus, they do a rousing business with delivery services such as Grubhub. Yet, nothing compares to dining in one of these landmark restaurants to enjoy not only the food but the authentic Asian atmosphere. Attributing to Convoy Street’s immense popularity is the fact that Convoy Street’s Restaurant Row is freeway close. Thus, its easily accessible from Interstate 15, and the inland high­ways of 163, and Highway 52. and it’s only minutes north of Mission Valley’s Hotel Circle via Highway 8 or the coastal cities via Highway 52 and Balboa Avenue. Where to begin should be determined by which street or freeway you enter on to Convoy Street from (see map). Then use the map legend with the helpful numbers which correspond to their loca­tion in the text to find your chosen dining destination. The SAN DIEGAN tour begins at the southern end of Convoy Street where Aero Drive meets Convoy Street. 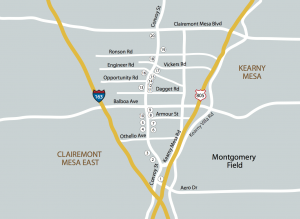 Access is accessible from Highway 163 and Aero Drive (see map). Tips for easy access to your favorite restaurant or cuisine can be found by looking at the legend on the map. And when you’re on Convoy Street by looking for architectural landmark along this thoroughfare. Phone numbers and website addresses have also been added. 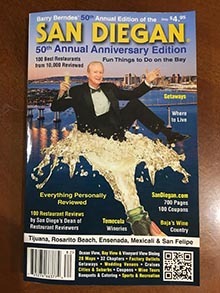 For restaurant reviews refer to the last page of this book where you will find all of the restaurant reviews broken up by cities and suburbs. These restaurants were reviewed by Antonio Pelaez, a Cordon Bleu Chef and Barry Berndes, San Diego’s Dean of Restaurant Reviewers. 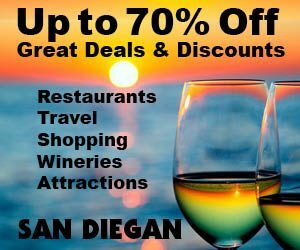 On the SAN DIEGAN tour, your first discovery should be the one and only award winning Emerald Seafood Chi­nese Restaurant (1) serving authentic Hong Kong style cusine. It’s a great introduction to the quality of aisan cusine found along Convoy Street. This easy-to-findrestaurant is located at the corner of Aero Drive and Convoy Street (see map). Emerald’s extensive award winning menu features fresh seafood right from their fish tank as well as hard to find egg nest soup. This is an award winning restaurant second to none. So dine here! The other outstanding, world class Hong Kong style restaurant receiving rave reviews is Jasmine Chinese Restaurant (11). Look for (11) on the Convoy map for easy access. A block farther north along Convoy Street, on your left, is Sunrise Town Center (2) at 3860 Convoy Street. The most established and easy to recommend dining destination here is the highly recommended Sunrise Super Buffet (2) (858-715-1608). As its names implies, it serves a delicious all you can eat oriental style buffet, the mall is also home to a half dozen excellent Asian restaurants and a very popular mini supermarket called the Nijiya Market (858-268-3821). The market is open seven days a week from 9 a.m.- 10 p.m., and it’s one of thirteen markets in the region. They also served lite cuisine. But the delicious dining alternatives doesn’t stop there as the Sunrise Town Center is also home to Wa Dining Okan (858-279-0941) for excellent Japanese cuisine, Mignon Pho + Seafood and Cafe Hue. Also highly recommended in Koon Thai Kitchen at 3860 Convoy St. (858-514-8111) [koonthaikitchen.com], which serves traditionally Thai cuisine in a casual atmosphere with big screen TV’s so you can enjoy your favorite event while you dine. Entrees of special note include delicious curry noodles, savory salmon and Singha beer. The next mall on the same side of the street, just to the north is at 3904 Convoy Street. Here you’ll find a legend in breakfast restaurants. It’s the Origi­nal Pancake House (3), which customers often say is the best pancake house in the city. And believe it or not, it was the first restaurant on Convoy Street when the street was literally vacant of any businesses of any kind. Here too is another long time resident of Convoy Street. It’s the Imperial Mandarin House (858-292-1222) at 3904 Convoy St It serves delicious Man­darin, Szechuan and Hong Kong style cuisine and is open 7 days a week. A nice surprise is Bistro Kaz at 3904 Convoy St. featuring Japanese European Fusion Cuisine (858-565-8861). this cozy restaurant serves delicious cuisine in a relaxed intimate atmosphere with the soft sound of lite jazz music playing while you dine. An extra special appetizers is their lobster bisque and their savory oysters Rockefeller. Check this place out. Other winners are Wings and Things, Mekong Cuisine Lao and Thai (858-279-1879) and Yoko­hama Yakitori Koubou Restaurant (858-277-8822) All are worthy of discov­ery in this one of many mini malls. It’s also important to note that there are four gas stations along this thoroughfare. Other southern land markets are the KFC, and a Super Sergio’s Mexican (fast food) Restaurant*, which are on the corner of Othello and Convoy Street along this important thoroughfare. Your next destination will be on your left and is called the Convoy Plaza (4) at 4176 Convoy Street. Here you’ll find Phuong Trang Vietnamese Restaurant (4), which is the most celebrated Vietnamese Restaurant in the city. They have won virtually every award of excellence imaginable. So definitely plan on dining here. Be sure to order the honey glaced wings to accompany a main course entree. Here too is the tiny Sushi Shirahama Restaurant, a popular spot for locals. You are also in for a treat when you visit the Big Joy Bakery & Cafe (858-627-0888), which is a few steps from Phuong Trang. One glance into one of their large glass display cases, and you will likely be enticed to to buy one of their exquisite pastries or plan to buy your next birthday cake here. Across the street is the eye catching architecture of the Thai Time Restau­rant at 4229 Convoy Street. It’s in the Convoy Center (6). Also calling this center home is the Convoy Tofu House serving authentic Korean comfort food including spicy tofu soup. This is a pop­ular no frills spot. Another good place is Sushi Katzra (established in 1975) as well as Fusion Izakaya serving tapas & sushi. Your next discovery should be across the street to the West. It’s the Convoy Village Mall (5) at 4344 Convoy Street The landmark restaurant here is Roadem All You Can Eat Korean BBQ ( 858-279-0900). Plus, you’ll also find Shan Xi Magic Kitchen serving hand made noo­dles, soups and dumplings. Plus, Tasty Bakery (858-278-2866) and Cafe Inter­national. Here too is the landmark Boot World Shoe Store, which is an easy to find landmark busienss to keep your bearings for where you are on Convoy Street. Keep your eyes out for the famous hot dog restaurant Der Wienerschnitzel Restaurant (7) with it’s pointed roof. It’s yet another easy to find landmark. Across the street is yet another restaurant with an interesting name. It’s Your Story Asian Fusion Restaurant (8) catering to adults with kids. Here too is Bing Haus Coffee. But don’t pass up a chance to dine at Grandma’s Korean BBQ & Tofu House (8) at 4425 Convoy St. It’s filled with cozy booths and opens at 10 a.m. daily (858-277-2220). Next door to the north is the classy Chef Chin (9) at 4433 Convoy Street, is a must dine in upscale restaurant serving Shanghai and Szechuan cuisine in a classy, upscale atmosphere. Don’t miss this place, [chef-chin.com] (858-499-8963). Equally recommended is just across the street to the west. This show stop per is Mana BBQ (10) at 4428 Convoy St (858-278-3300). They serve delicious Korean Style BBQ and have three other locations to serve you in Chula Vista, San Marcos and Mira Mesa. Parking can be a problem, but patrons always find a spot to park. With parking being a prob­lem, think about taking an Uber. Balboa Avenue is a major thoroughfare (see map), which basically splits this restaurant row into two halts. One being south of Balboa Avenue and the other north of Balboa Avenue. It also offers easy access to the two halves via the 805 Freeway to the West and Highway 163 to the East. Believe it or not, but Balboa Avenue is the second busiest thoroughfare in the city, second only to Miramar Road. So there is a lot to like about Balboa Avenue as being a wonderful and quick access route to and from Convoy Street via major freeways. As you approach the busy intersection of Balboa Avenue and Convoy Street look for several landmarks to guide you. On one corner is a Jack-in-the-Box Restaurant(10), kitty corner across the street is a gas station and the third landmark is the first of many car dealerships, which can be found at the north end of Convoy Street. This one is a classy Jaguar dealership showcasing their latest models. The next mall to the north is a low key perennial favorite called ChopStix Sushi & Noodle Cafe (12) (858-569-9171). House favorites incude Miso Ramen, Champon Ramen, Ton-Katsu-Curry and more, and next door in back is the SOHO Gastropub, a local late night hot spot. Across the street on the west side at 4620 Convoy St. is Prime Grill (13) (858-277-0800) a totally classy lunch and dinner spot serving delicious cuisine, and Caffe Bene (13) at 4620 Convoy St., which is open from 9 a.m.- midnight serving lite fare and delicious desserts. Next door to the north on the same side of the street is the busiest mini mall of them all at 4646 Convoy Street This popular dining destination with its extra small parking lot is home to almost a dozen restaurants. For starters, facing the street is the insanely popular Pokirrito (13) serves poke bowls and sushi burritos; Rakiraki Ramen & Tsukemen (13) serves mouthwatering ramen delights.. Here too is the awesomely popular Crab Hut Louisiana Seafood Kitchen (858-565-1678) [crabhutrestau-rant.com]. Believe it or not, you’ll actually be eating with your hands. Sorry, no utensils, but they do give you a bib. Then there’s the unbelievable Yu’s Garden Tofu House. Here too the legendary O’Brien’s Pub (858-715-1745) [obrianspub.net]. Back in the 1990’s it was the first authentic micro brew pub in town. Today, it serves 24 micro brews on tap along with lite fare. Always filled with happy eaters is a dessert spot called Tappioca Express. Then side by side all in a row are the must dine in Red Moon Noodle House, Tasty Noodle House, and Shabu Shabu House, featuring self cooked fondue style meals. Then after an unbelievable meal everyone stops at Angel & Hearts for one of their amazing desserts. This mini mall is a slice of Asian heaven. Seoul Plaza (14) is just across the street on the east side at 4647 Convoy Street It’s home to Nozomi Sushi and Said, and then there’s Friend’s House Korean BBQ (858-292-0499), Facing East, and MAPOB Korean BBQ (858-717-43360). The latter is an all you can eat BBQ place with a big sign boast­ing that they serve the best Korean BBQ in town. For curisoty sake alone, you gotta decide if they are right. They are only open for dinner. Also in this same mini mall is an equally inviting named restaurant here too is the Sub­marine Crab Restaurant (858-987-0333) serving cajun cuisine. Dining adventures abound here. Your next stop should be Convoy Plaza (15) at 4681 Convoy St. It’s on the east side of the street. 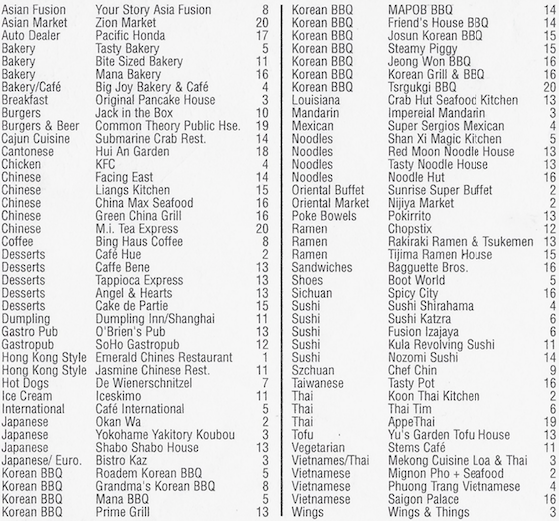 Here you’ll find Josun Korena BBQ (15) (858-277-8625) offering an all you can eat menu. Liang’s Kitchen (858-277-5573) is a reliable standard with a dozen loca­tions regionally to serve you. Next door is the soon to open Steamy Piggy. Ramen lovers will also want to check out the Tajima Ramen House (858-576-7244) [tajimasandiego.com] located in a tall brown building in the back of this mini mall. It’s has 6 locations, so it’s gotta be good. Amazingly, Convoy Street is also home to many extremely popular dessert only restaurants. One of them is a few steps north, called Cake de Partie (15) at 4685 Convoy St. (858-987-0033) [mydeepcdp.com). It’s a popular dessert spot, set in a casual setting serving Thai coffee, tea, refreshing sodas and desserts. Across the Street is an Infiniti auto dealership and next door is the Plaza Del Sol Shopping Center (16) at 4698 Convoy St. This plaza is home to the wildly popular China Max Seafood Restaurant (16), which is the class act of Convoy Street (858-650-3333) [chinamaxsd.com]. This restaurant has been awarded many awards of excellence including being selected at one of the top 100 Chinese restaurant in America by the Chinese Restaurant News. Zagat also touts their excellence. On hand to greet you is the charming and gracious owner Cindy Wo and in the kitchen preparing the memorable cuisine is her husband. Lunch is served from 11 a.m.-3 p.m. daily and dinner till 10 p.m.. Dim sum is served daily along with over 100 memorable entrees including Peking duck, honey walnut shrimp and abalone with oyster sauce. These memorable meals are served on white starched table clothes by attentive servers in a sparkling setting. Definitely plan to dine here! Also calling this mall home are a multitude of other delicious discoveries with names like Spicy City, Noodle Hut, Saigon Palace, Jeong Won BBQ, Korean Grill & Tofu, Green China Grill, Mana Bakery, Tasty Pot and the Baguette Bros, sandwich shop. All are at (16) on the map. In the next few blocks to the north are several more car dealerships includ­ing Pacific Honda (17) and Kearny Mesa Subaru. Apparently Asian cuisine and Asian made cars go hand in hand. Standing alone at the Corner of Vickers Road and Convoy St. is Hui An Garden (18) another popular destina­tion serving Cantonese cuisine. At 4805 Convoy Street is Common Theory Public House (19) (858-384-7974) serving great tasting mico beers, tasty burgers and lite fare. It’s open daily from 11:30 a.m. [commontheorysd.com]. Here too is AppeThai, a 4 plus rated cute Thai restaurant. Finally the Convoy Asian Restaurant Row will come to an end at the corner of Convoy Street and Clairemont Mesa Boulevard. Here on the west side of the street is the huge football field sized Zion Market (20). This Asian supermarket makes Vons Super Markets look like a 7/11 fast food store in a size com­parison. Thus, it’s a must to step inside and see the orient in a whole new light. Be sure to pick us some fresh Bok Choy or some green tea ice cream. Here too at the eastern end of the building is the highly recommended all you can eat Korean style BBQ restaurant Tae Guk Gi patio & Cafe. One step inside and you’ll know that you want to eat here and if so bring all of your friends. Next door is the M.I. Tea Express specializing in teas and lite meals. For a dining experience second to none, you should enjoy discovering the wonderful Asian restaurants along Convoy Street in Kearny Mesa. Plus, it’s freeway close. So start doing what thousands of hungry diners do daily. They dine in San Diego’s famous Asian dis­trict, and so should you.